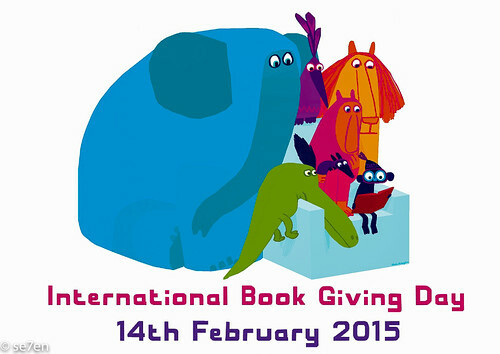 On International Book Giving Day we announced our library project for this year. I’ll be honest it isn’t an easy one, and we need all the help we can get. 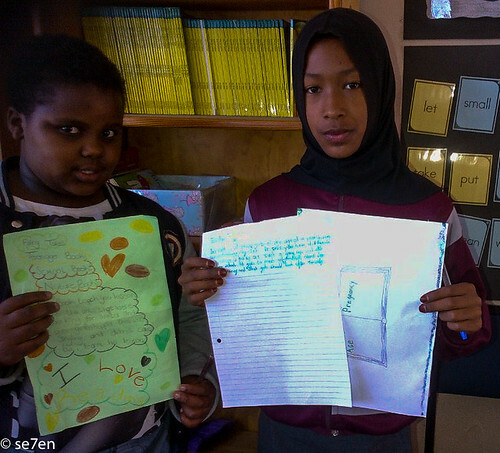 We are hoping to create a library for children living in one of the toughest areas of Cape Town, children who have had to grow up way too fast and children who are all too familiar with a world that has let them down. We would really like to make a difference in their lives, for no other reason than that they deserve it. In our family books are key to our everyday lives… we read and read and read. We have access to books, in fact we have heaps of books… and if that isn’t enough we can amble to the library almost every day of the week and borrow another handful of books. My children don’t know a day in their lives when they weren’t treated to a bedtime story. Books provide us with a world we a can escape in to and I think these children, more than most, may well need a chance to escape from the world that they live in. They don’t come from homes where they can experience a whole heap of extra-curricular activities, and there certainly won’t be piles of books for them to read. There world is literally to school and home again, and not much happening on either end of that continuum. 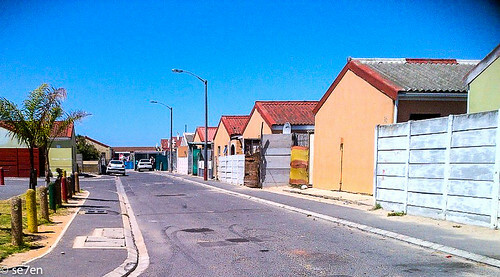 They live in an area which is notorious for violent crime and gangsterism, domestic violence and substance abuse. The option of ambling down the street to the library is an unknown luxury and the chance to vanish into another world non-existent. Now I don’t know about you, but when I walk into the library I always head for certain books first and then explore further from there. Always heading for my favourite genre and seeing what’s in. So I asked my kids what their favourite kinds of books were… the one’s they seek out first. The school does not have a functioning library yet. We are that library… we are the books about technology and soccer, we are the teen reads that the older girls want to read. We are the fiction books that fill their dreams and the fact books that satisfy their curiosity. There are almost 1000 students in the school ranging from Grade R to Grade 7. Not only only do all these children have a problem with accessibility to books, but they also have a problem with literacy. 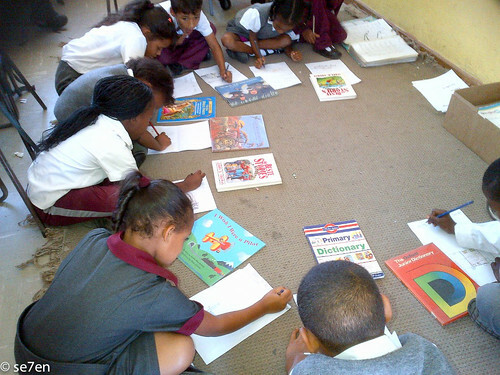 These children desperately need to be inspired to read when they are young and enthusiastic. 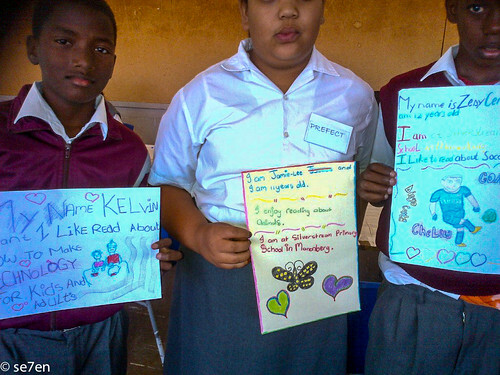 In order for these children to find the books they dream of reading they need actual physical contact with books. In order for them to become literate and to break the desperate cycle of the community that they are living these youngsters need books and piles of them. I firmly believe that we can provide books for them. I know we cannot change the world they are living in, but we can affect their response to it… and book by book I believe our readers could make a significant difference in their lives. 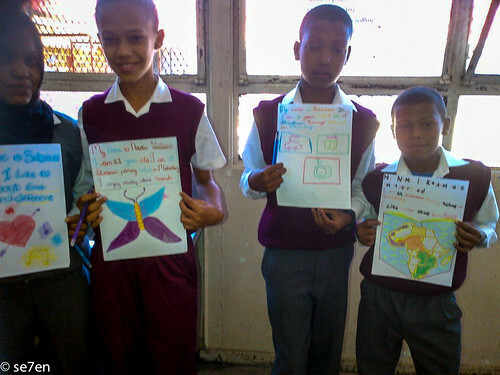 While all the students do learn English, many of the learners have Afrikaans as their first language. 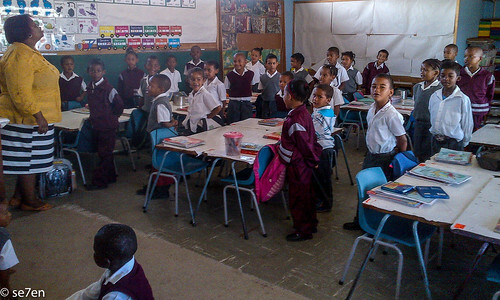 English books are very welcome, so are books in Afrikaans. Any books will be great, story books, picture books, craft books, cook books, reference books… really any books. There is a large community being served here. If you are shopping overseas and would like to buy local language books then click on the South African vendor to find books and they will deliver locally for you. We would love if you could photograph the books you are sending, if you shop on-line then just send us a list of the books that you ordered. If you have a blog and write about it then let us know and we will have a Progress Post each week. I will pop the photo’s you send into the blog post and if you do have a blog there will be a chance for you to link up as well. We are excited about this project and we really hope that our readers seize the day and join us. It doesn’t have to be huge, if even one percent of our readers pop a book into an envelope and post it off, we will have a library. So here’s to hoping that we hear from you all really soon. Leave a comment saying you would like to join us, contact us… Please share this post… whatever you need to do… we would so love to hear from you. If you have emailed already I am trying to reply to all your emails by the weekend. If for some reason you don’t hear from us before next week, please email again… there could well be a glitch or an oversight on our part. We know that a project with a deadline often works better so could we aim to get our books in the mail around mid-March. That gives you a couple of weeks to choose a book or two and mail them on. 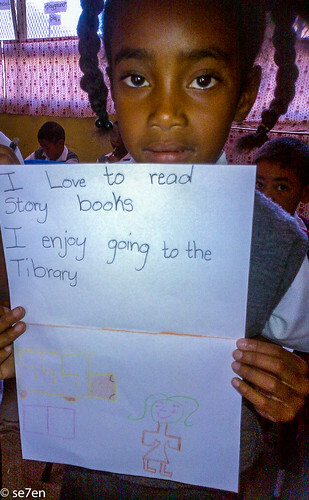 We would like to thank International Book Giving Day for their enthusiastic support and Biblionef South Africa, for helping us to find a community in our area that needs a library, over the years they have provided us with unprecedented support in helping us to pursue our dream to provide books for children just like ours, who otherwise wouldn’t have access to books. Hi Karen, Thank you so much!!! I am working on sending everyone the shipping details this evening and I am so thrilled that you want to be part of our project – thank you!!! Have a great day!!! I am trying to send emails Mrs FF… but load shedding and lack of internet are thwarting my every move. So frustrating, I am going to try again tomorrow. Have a good evening!!! Hay Irene, Thanks a ton… really really appreciate your support. Have a great day!!! Will do a personal delivery soon, I hope! And I’m blogging about it again today! Hay Marcia, the books are finally starting to roll in slowly. I think it is going to be great!!! Please send me the shipping details, I have many books that I could donate! Thank you so much Sam, I have sent you an email!!! Thanks so much and have a great day!! !